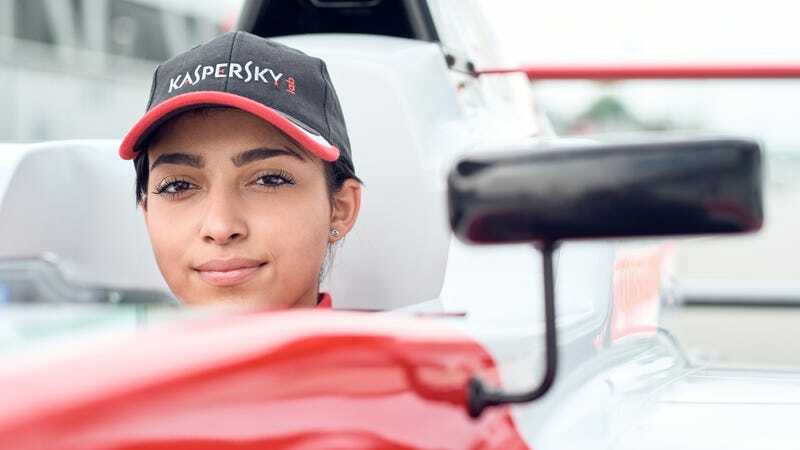 Amna Al Qubaisi at the the Italian Formula 4 Championship at Monza in May of this year. Just six months after the country lifted its ban on female driving, several women race-car drivers will participate in a Formula E test session on the Saudi Arabian streets. The test will happen right after the Formula E race in the city of Ad Diriyah on Dec. 15, and at least seven women will drive in it. Formula E, an all-electric racing series that’s only a few years old yet has manufacturers flocking to it to test their electric technology in harsh racing conditions, will also have women drivers flocking to it—for at least one day, that is. Seven of the listed 22 spots for Formula E’s first in-season test of the year in Ad Diriyah next month are women, and a Formula E announcement said two other teams are looking to book female drivers for the test as well. The women currently on the list include Sauber Formula One test driver Tatiana Calderon, Formula 4 driver Amna Al Qubaisi, British Formula 3 winner Jamie Chadwick, Supercars driver Simona de Silvestro, BMW Motorsport’s Beitske Visser, IMSA driver Katherine Legge, and former Lotus F1 development driver Carmen Jorda. They’ll make up nearly a third of the drivers at the test. It’s great to hear about an influx of women into typically male-dominated racing. But there’s a lot going on under the seemingly positive surface here, like the report that Formula E offered teams—none of whom actually have a woman competing for them next season, according to the entry list the series published last week—an incentive to book women for the test session. Formula E will host an in-season test after the Ad Diriyah ePrix, with extra slots handed to teams that run a female driver in addition to their regular racers. All teams that have arranged to run a female driver will be allowed to enter two cars in each session. Audi and Jaguar are the only teams running a single entry during the test. More cars during a test session means more data to build off of for the season, so it’s solid motivation to follow through. Jalopnik has reached out to Formula E to confirm that teams putting a female driver in their test lineup will get an extra car like Motorsport.com reports, and will update this if we hear back. In most situations, it’s understandable to offer incentive to get teams to add women to their lineups. People often need a nudge, or sometimes a hard shove, to break their usual habit of overlooking other candidates in favor of the ones who look like race-car drivers mostly have in history: white and male. But if incentive was offered here, it all feels a little icky—as if the goal was also to make the headlines about all of the women testing rather than about another international motorsport heading to a country known for its oppression. Formula E starts its seasons at the end of one year and runs them well into the next, meaning the 2018-2019 season starts next month. This year’s opener and the site of the test session is the street circuit in Saudi Arabia, which, as you might know, has a record of human-rights abuses involving but not limited to women and people on the LGBTQ+ spectrum. Women have only legally been able to drive in the country since June of this year, after all. We have of course received complete assurances, actually it has been the request of the Saudi authorities that women participate, drive in the Formula E event, and if they are not in a racing team we will organise some way for women to drive around the track, do a demonstration which is really the intention of the new years of Saudi Arabia to showcase that change. Women will be allowed at the event as spectators, obviously women that come from abroad, like yourself will be allowed to come, work and report on the race. We see that as a great element of change in a country that didn’t have all those right in the past. And female driving participation there will be, since Formula E reportedly offered the extra car as a reward for it. The end result is positive: people who break the typical white, male mold making up more and more of the driving field, normalizing their presence there, and getting to show off their skills in front of a larger audience. But the path get there was twisted, and, as we’ve seen from the all-male lineup for next year’s Formula E season, the triumph could mostly be short lived.